Another hot humid day, but at least it was 10 degrees cooler than last week. Returning this week were Eric Moore, Tom LaRochelle, Roger Hall, Renee Reder, and Andy Moskal. New people were Colin Walters from Dell, Judy Giroux, David McNamara, and Rob Gustafson from Amphenol TCS, Rob's son Jim, and Julia Croteau, a local high school student. David and Colin securing the landing section to the J-bolts in the concrete footings. Detail of the anchor system. 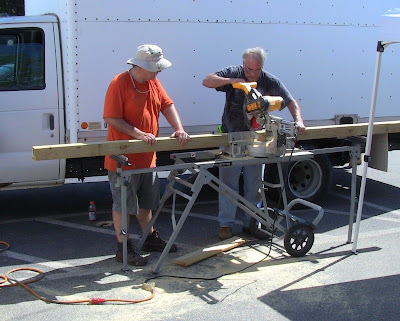 Judy and I cut up about 40 boards on the chop saw for the decking. 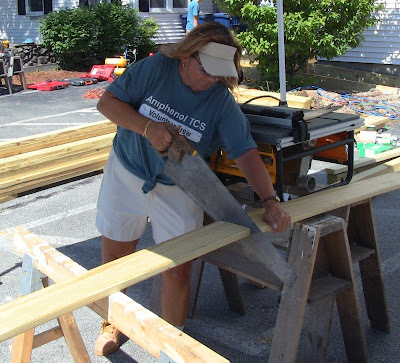 Here she's using my 100-or-so-year-old crosscut saw to complete a cut in a board that was bowed, binding the chop saw blade. Rob and Jim securing the joists in the landing with hangers. 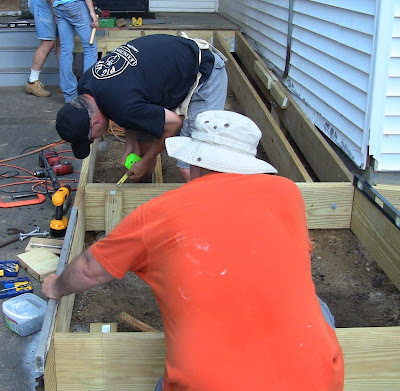 Renee and Roger are setting posts in the background, while Eric clears the ground for another. Colin and Andy cutting a post. 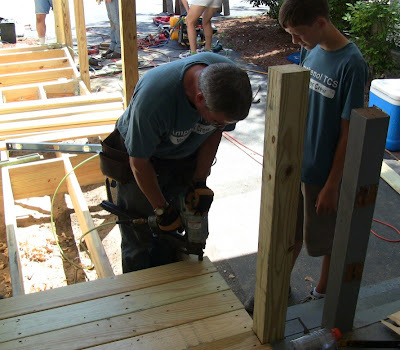 Tom and Julia nailing up a crossbeam hanger in the lower ramp. Andy and Rob bolting posts in. 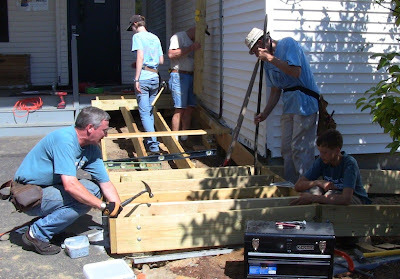 Rob and Jim start nailing down the decking. 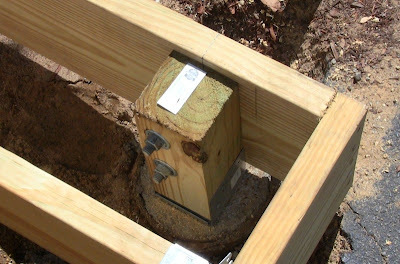 The posts in place on the lower ramp, along with the sleepers for the lower landing. 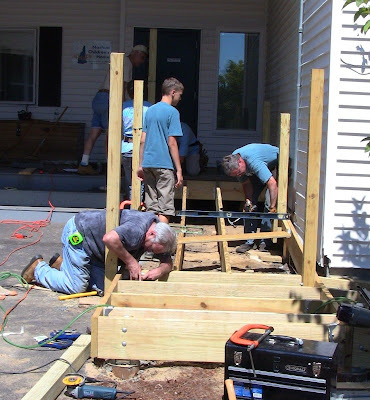 David, Rob, and Jim finishing the landing decking. View down the ramp, with some of the railing in place. 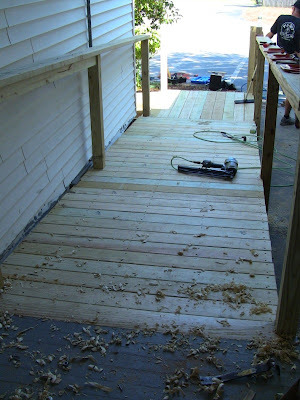 I got to do a little hand tool work among all the power tools, using my #5, #6, and NX-60 planes to flush the transition from the 1" decking to the 3/4" porch flooring and fair it out. Hence the shavings. Jim was fascinating by the planing process and results. The day's progress. Looks good and solid! This will continue next Saturday, but I expect to be out of town, so I won't be able to work on it. 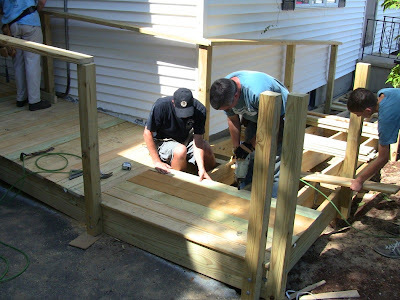 They'll add the remaining railings and balusters, add the final section after the lower landing, and complete the decking. I did get in a little trouble with my daughter when I got home. She asked why I was so tired. When I told her what I'd been doing, she said, "I would have gone with you!" Oops, it never occurred to me to ask her! Well, they have more projects. Have you checked with the local first responders that the ambulance stretcher can negotiate the turn at the bottom. 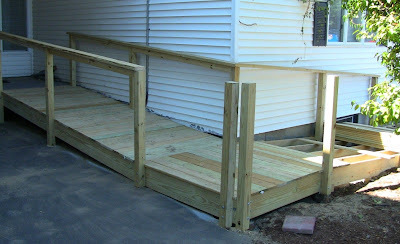 Should do but you may need to modify the handrail there or make a bar removable or change the middle bar height. Always an issue if not the right height or arc. That's an interesting concern. I've forwarded it to Eric. 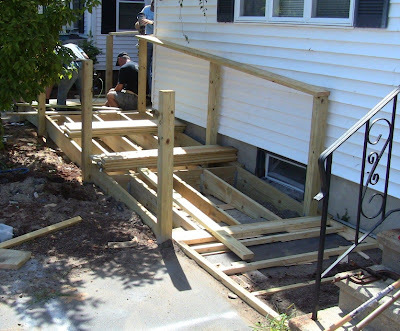 The door swings out and to the right, forming a clear egress path to the porch steps next to the ramp. Yes, the width, etc., is dictated by code - in this case it's to commercial rather than residential standards. I would assume - but don't know - that first responders had their say in establishing that code.